DON'T PANIC: For now, contact with infected birds is still required for humans to contract avian flu. It's still in an "avian pattern," says Read. NIAGARA-ON-THE-LAKE, Ont. – Transport Canada spokesman John Read shared some sobering thoughts on the possibility of an avian flu pandemic at a breakfast seminar held at the Private Motor Truck Council’s recent annual general meeting. 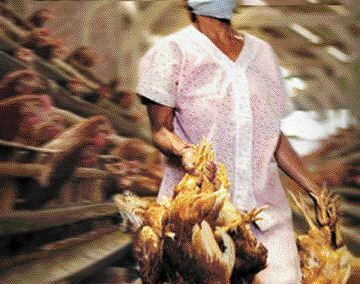 But so far in global cases, more than half of the people known to have been infected have died of the disease, which has scientists discussing avian flu in the same breath as the Spanish and Hong Kong flus, which killed millions. Currently, the virus is still in an “avian pattern,” explained Read, meaning humans must be in contact with infected birds to acquire the disease. But recent cases in Indonesia suggest the virus could mutate and become spreadable from human-to-human contact. “If it mutates, it will reach Canada within three months, no matter where it takes place,” Read said. PHAC is predicting an avian flu pandemic will claim the lives of 11,000-58,000 Canadians if an outbreak occurs. About 70% of those who are exposed to the virus will be clinically ill – meaning at least half a day in bed will be required. On average, adults will experience a six-day infection period, but they will be contagious even before any symptoms are experienced. Once avian flu strikes Canada, Read said it could take two to three months before the vaccine is developed. PHAC has said it will be six months before the vaccine is ready for general use and by then the virus may have developed a new strain that’s immune to the vaccine. The good news is, Canada has a large capacity for producing a vaccine once one is created, Read said, adding we can produce about 400 million doses within a year. That poses the ethical question of whether Canada will horde it for the use of its own or share it with less fortunate countries around the world, he pointed out. It also poses the ethical question of who is important enough to receive the vaccine when it’s first available in limited quantities. Despite the importance of getting goods to market, truckers won’t likely be high on the priority list. Transport Canada has predicted an employee absence rate of about 35% is possible if an outbreak occurs in Canada. That begs the question, how will the trucking industry keep the wheels rolling? There’s not much employers can do about absenteeism, considering Canadian labour laws allow employees to refuse to work in an environment if there’s reasonable cause to believe conditions exist in the workplace that would endanger them. There are ways, however, that the trucking industry can attempt to keep the wheels in motion in the event of a pandemic. Read said companies should prioritize the goods they move, ensuring medical supplies and fresh food are delivered before non-essential items like shoes. Currently, about 1% of truck deliveries in Canada are medicine and pharmaceutical products while 48% of truck deliveries are fresh food. In the event of a pandemic, truck cabs should be cleaned with alcohol wipes with an alcohol strength of 75% or greater, he advised. Drivers should wash their hands after touching common objects, take a seasonal flu shot in advance of an outbreak, avoid alcohol and tobacco (which weaken the immune system) and avoid people who have been infected. Fleet managers should write down the names of drivers who have been infected and the dates they got sick, because once they get better they will then be unable to contract the virus and can return to work and deliver goods into high-risk areas. If a pandemic occurs, the trucking industry should brace for a critical shortage of drivers, loading delays, delays at border crossings (and even pressure to close the US border if a breakout occurs in Canada first), delays at distribution centers and delays at receiving docks, Read warned. Overall, there could be a reduction in truck shipments of 10-30% for weeks if proper planning doesn’t take place, he warned. Transport Canada has been considering possible solutions in the event of a pandemic including relaxing cabotage rules and dismissing HoS violations caused by unavoidable delays. Despite kicking the day off with such a gloomy topic, Read stressed not to panic – as a pandemic is not a certainty. “I still had eggs for breakfast,” he mused.